Growing rose bushes in containers is an option when dealing with limited spaces. Gardeners who cannot work at ground level in a traditional garden can move containerized rose bushes to table height to work on them. Plant pots are moved around to change the look of any container garden. 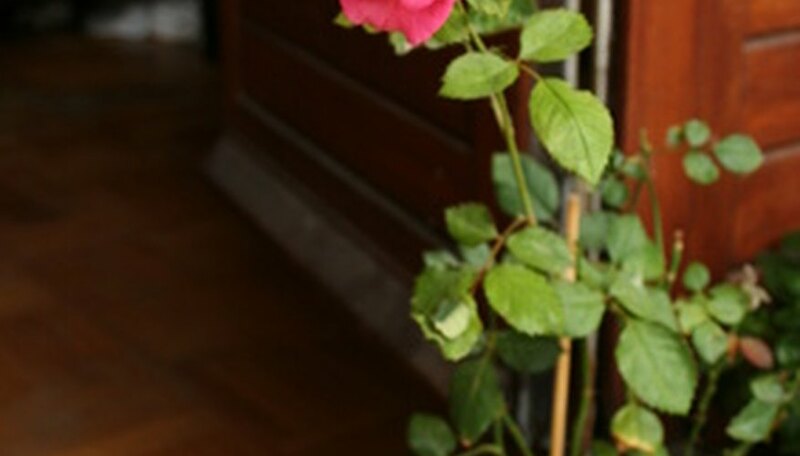 Any type of container is suitable for growing rose bushes as long as it has good drainage. Most rose bushes need at least a 15 gallon container to ensure good root development. A wide base on the plant pot will help keep the wind from tipping over the rose bushes. Plant your rose bushes in a soil mixture of 3 parts compost, 3 parts perlite and 4 parts potting soil. This will give the rose bushes the fast-draining soil the roots need. Add 1/4 cup of superphosphate to the soil before planting. Spread 2 to 4 inches of sawdust mulch around the base of the rose bushes. Mulching the top of the container will conserve water and keep the soil cool. Pour water into the top of the container and let it run out the bottom at least once a week. Fast-draining soil dries out quickly. During hot or windy weather, rose bush containers need watering every day. Feed your containerized rose bushes twice a week half the recommended dose of rose fertilizer 5-7-2. Roses are heavy feeders and need supplemental resources when grown in a plant pot. Expose the rose bush containers to two or three heavy frosts in the fall to place the roses into dormancy. Prune the canes back to 2 to 3 feet tall with sharp pruning shears. Move the containers to a cool, protected area. Water the rose bushes once every month. Change the soil every three years to get rid of salt buildup left over from fertilizing. Inspect and trim the roots if they are root-bound or damaged. Do not fertilize six weeks before the first fall frost date. Fertilizer stimulates new growth that is vulnerable to freezing damage. Do not use a saucer under a rose bush container. Roses do not like wet roots and will die if the roots are trapped in standing water.